Cask Ales at Classic City Brew Fest! Along with 400+ world-class craft beers and super rare bottle share treats spread throughout Graduate Hotel's three ballrooms, outdoor terrace and Foundry music hall, the Classic City Brew Fest's Cask Ale Pavilion always proves to be extremely popular with attendees. Here are descriptions of all the exciting, one-off cask ales that will be available for sampling on April 9 in the Classic City Brew Fest's Cask Ale Pavilion. These casks alone are worth the price of admission! There's NO WAY you can miss tasting these exclusive casks! Abbey of the Holy Goats Chèvre Noir. This special cask contains single origin coffee from Rwanda, cocoa nibs and Madagascar vanilla beans. Akademia / Southern Brewing Company collaboration Noctua Chaos Willett bourbon barrel-aged with cocoa nibs and organic cherry and pomegranate juices. Inspired by bourbon-soaked chocolate covered cherries. Arches Brewing Five Week Sail - An 8.4% ABV, lagered Baltic porter that combines the bold flavors of an English porter with the richness of a Russian imperial stout. Look for a roasty, caramel profile backed by chocolate undertones. BlueTarp Go Funk Yourself - Our Brettanomyces conditioned IPA has been dry-hopped with Calypso and Simcoe for a dry, funky, floral palate and finish. Burnt Hickory Charred Walls of the Damned - Check out this toffee, honey, maple, cake version of our infamous 13% ABV Belgian quad. Cherry Street / Lincoln Fill Station collaboration Continental Creamsicle - A double dry-hopped, juicy IPA with oranges, orange zest and vanilla beans added to the cask. 8% ABV. Creature Comforts Paradiso Swizzle is our 4.5% ABV Athena Paradiso with added apricot, pineapple and citrus zest. Devils Backbone Black Lager - A German schwarzbier style lager. Medieval brewers browned barley over open flames, but today we get subtle roasted, coffee flavors by using the finest toasted malts. Dry County Gin & Juicy - This twist on a GnT starts with our Noonday Extra Pale Ale, then we added St. George Gin, organic Limeaide and extra Citra hops. Eventide The 'A' IPA with Blood Orange - Tropical fruit notes are enhanced by additions of blood orange for deeper citrus complexity a hint of mint. 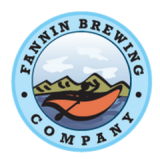 Fannin Brewing Chief Whitepath in Paradise is our white IPA with lemongrass, lime leaves and toasted coconut. Left Nut Cara Bee N’ Breeze - Stinger Rye Ale with local wildflower honey, Cara Cara oranges and fresh ginseng that provide notes of rose hips, citrus and a subtle spiciness. Lonerider Sundance. A blend of ruby red and pink grapefruit puree is added to our crisp saison to create Lonerider's newest seasonal. This cask was dry-hopped with Idaho-7, an experimental hop with notes of tropical fruit and resin. 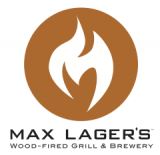 Max Lager's Fleur Cerise - 6.6% ABV farmhouse ale that was solara barrel-fermented with a mixed culture, then aged on Balaton cherries to create a beautiful American-style kriek. Monday Night Drafty Kilt. This exceptional cask combines our popular, malty Scottish ale with additions of chocolate, almonds, coconut and cherries. 7.2% ABV. Moon River Cosmic Terror is our dry-hopped pale ale brewed with Galaxy and Southern Cross hops, then cask-conditioned with guava paste and Cashmere hops for a tropical fruit explosion. Piedmont Brewery & Kitchen Midnight Rider Robust Porter was aged on toasted coconut and rum-soaked oak chips. With loads of chocolate, roasted malt, coconut, American oak and rum complexity, it's "decadence in a cask." Quest Brewing Makara Double IPA is aggressively hopped with Citra and balanced with five varieties of complex malts. 8.7% ABV, 110 IBUs. Red Brick Chili Cinanilla starts with one of our most popular beers, Vanilla Gorilla, that we aged in oak barrels with cinnamon, dried ancho chilies and extra vanilla. Red Hare The Passion of My Peach is a tart Berliner weisse with mouth-watering additions of peaches and passion fruit. Scofflaw Hooligan is a hazy, juicy IPA with loads of late addition hopping. For an extra floral punch, we added Loral and Galena hops to this cask. Second Self Hotlanta - Our newest beer, ATaLe, infused with fresh Thai chilies for a spicy bite and mild warmth. Service Brewing Compass Rose IPA offers grapefruit flavor and aroma driven by Citra hops, but the addition of persimmon and tarragon in this unique cask adds sweet honey flavors with a hint of black licorice. 6.6% ABV. Southern Brewing Fruited Berliner. In a nod to adding woodruff syrup to a traditional German Berliner weisse, our vibrant green Southeastern Berliner cask has notes of lemon and lime with tropical fruit. Oh, yeah! Steady Hand Flower Business - A 9% ABV imperial IPA with a hazy orange color and a bright, juicy hop flavor with notes of fresh squeezed citrus, tropical fruit, sweet peaches and subtle pine. Terrapin Fruitcentric Gose - Fruitcentric combines watermelon, kiwi and mango juices for a tart and refreshing fruitastic drinking experience. Twain's What A Mild Night - 3.5% ABV English-style mild ale with elegant notes of chocolate, toffee and caramel that are quite full for such a lower strength session ale. 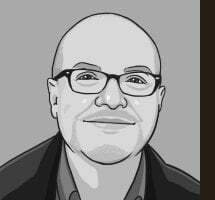 This style is perfect for cask-conditioning. Wicked Weed Lupulin Lab IPA - This version was brewed with Creature Comforts using experimental Hop 438 lupulin powder and orange zest added to the cask. It's also known as Thirst Puncher IPA. Wild Heaven White Blackbird Saison. This cask was conditioned with funky Brettanomyces yeast and flavorful yellow plums. Wrecking Bar Jemmy-Chino Stout is conditioned on toasted almonds, milk sugar, coffee beans and vanilla. Roast, chocolate and coffee from the base stout are accentuated by cocoa, vanilla, light marshmallow and nutty notes. Click here for the ABW page with calendar. TERRAPIN pint night at Blind Pig Tavern East Side. 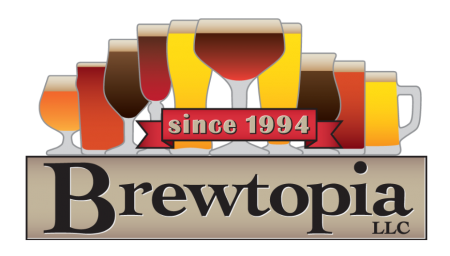 05:00 PM - AKADEMIA BREWING / SOUTHERN BREWING tap event at Chops & Hops in Watkinsville. 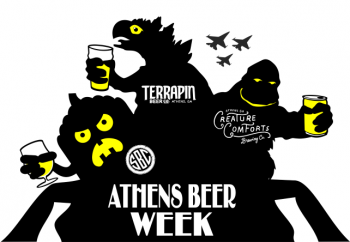 Three SBC and Two Akademia beers on with special give-aways and flights. BEEF 'O' BRADY'S local (Athens/Atlanta) beer flights for only $7.50. TRAPPEZE PUB will be tapping rare beers all week. 04:00 PM - COPPER CREEK BREWPUB $2 house pints all evening. 06:00 PM - SOUTH KITCHEN + BAR hosts a night with Southern Brewing Company featuring kegs of wine barrel-aged Cecil, Warpig and Wild Azalea IPA. 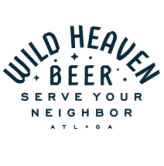 Special guest Josh Aaron from Akademia Brewing will be on hand with a keg of Willett barrel-aged Noctua, and chef Benson will have a tasty SBC inspired special. 06:30 PM - Optional CLASSIC CITY BREW FEST VOLUNTEER meeting for those interesting in pouring at a specific table. SOUTHERN BREWING COMPANY tap takeover at South Kitchen & Bar. 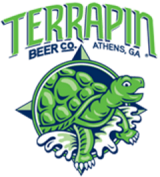 09:00 PM - TERRAPIN KARAOKE at Mellow Mushroom. RED HARE tap takeover at The Place with Long Night Lager, Gem City Lager, Ain’t That a Peach Berliner Weisse, Cotton Tail Pale, Gangway IPA, SPF 50/50 and Watership Brown. 05:30 PM - TERRAPIN tapping of Cumulus Lupulus at Blue Sky Bar. SOUTHERN BREWING COMPANY tap takeover at The Root. SOUTHERN BREWING COMPANY tap takeover at Blue Sky Bar. TERRAPIN special barrel-aged beers at Trappeze. 04:30 PM - SOUTHERN BREWING COMPANY tour. SOUTHERN BREWING COMPANY tap takeover at Saucehouse. 11:00 AM - CATCH 22 GASTROPUB - Special beers and lunch items. 02:30 PM - SOUTHERN BREWING COMPANY tour. 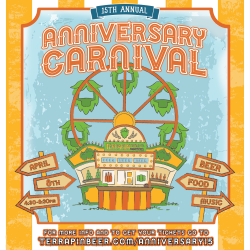 04:30 PM - TERRAPIN'S 15th ANNIVERSARY CARNIVAL. Terrapin Beer Company. 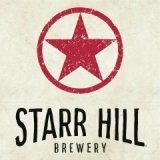 Unique casks, barrel aged beers and brand new offerings. 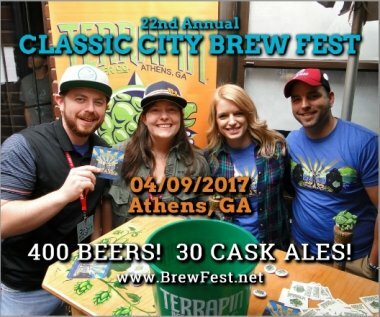 02:30 PM - 22nd annual CLASSIC CITY BREW FEST, Graduate Athens Hotel. 400+ beers to sample, Cask Ale Pavilion and live music! 06:00 PM - POST-BREWFEST GATHERINGS at COPPER CREEK brewpub, TRAPPEZE PUB and HI-LO LOUNGE. Trappeze will be tapping special kegs and casks from Georgia breweries. Here's a sensational IPA that's made in the South with a beautiful mouthfeel and hop profile. It's brewed with oats and wheat for a unique malt profile built to let the hops be the star of the show. We use huge additions of Citra and Simcoe hops for a juicy and aromatic ride. 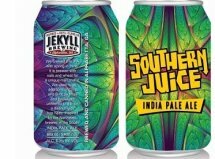 Southern Juice is packaged unfiltered to deliver a hazy, hoppy and distinctive finish.